Metal support jacks hold beams in place on a Mount Carmel ward. Sources said that almost half of the Attard hospital, built in 1861, has been condemned and patients have been crammed into the few wards that so far have been certified as being safe. A meeting was held today between the hospital's administration and the MUMN, during which agreement was reached on relocation and a programme of repairs. Patients are to be moved to old people's homes. As a short-term measure, scaffolding has been put up to support parts of the ceiling at risk of collapse. In the more sensitive areas, architects instructed workers to install metal support jacks to hold old beams in place. The sources said that most of the wards were overcrowded and, in some of them, patients had been “packed like sardines”. “There are other wards that seem like we’re back in the time of Florence Nightingale.,” one source said. A Health Minister spokeswoman acknowledged that the hospital had structural problems that were being addressed by the Foundation for Medical Services. “Mount Carmel Hospital is a building of over 150 years. Like any other building its age, Mount Carmel has structural limitations and requires maintenance and refurbishment. The Foundation for Medical Services is engaged in various projects there,” she said. She noted that works were being carried out to refurbish Male Ward 2, a new Substance Use Disorder Unit was being designed and parts of the water system were being replaced. 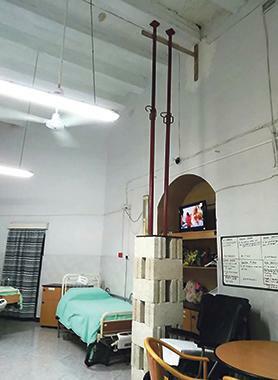 Wooden beams in one ward and the adjacent corridor were being inspected, water ingress and electrical installation problems were being addressed and structural and service-related reports commissioned, she added. “These reports include inspections of beams, ceilings, roof slabs and stairs. A project manager to oversee these and other works is in the process of being engaged,” the spokeswoman said.